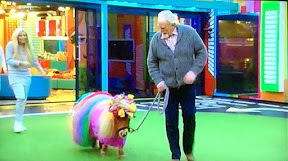 HERE'S James Cosmo taking the mickey out of his Game of Thrones character by leading a pink pony through the Celebrity Big Brother house. Referencing his character Jeor Mormont, the Scots actor said: "I am the Lord commander and this is my steed" as he walked shetlander Tony Pony through the house without Bianca Gascoigne noticing him in a challenge. While Jasmin Waltz teaches Bianca meditation techniques a thrilled James takes a leisurely stroll with Tony through the house and into the gardens. We can't wait to see more action from the sweetie that is James C over coming weeks.